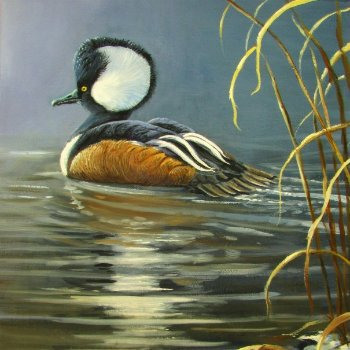 Wildlife art, nature art, bird paintings and spiritual art are just some subjects Canadian artist Samuel Véronneau is passionate to paint. Born in Laval in 1987, Samuel Veronneau moved to the countryside in the Eastern Townships, in Quebec, at the age of 2 years. He will be obsessed at a very young age by the nature which surrounds him and will quickly finds the use of the pencil to express his fascination of the ambient world. They will become inseparable, at school, at work, at home, every piece of paper finds their subject. At the end of his secondary studies, Samuel, somewhat undecided as to his career orientation, decided to devote himself to the family business on the farm and learned the trade of butcher. He discovered, through private lessons, the universe of oil painting, a medium he will use until today. A few years later, after the success of the company, the little boy whose imagination had been marked by the stories of the conquests of the west and the wild lands resurfaced in him. He responds to this call of the woods and adventure by completing a degree in protection of wildlife territories at the forestry school of La Tuque. Then, through many jobs and hunting and fishing trips, he traveled to discover the territory of Quebec, its fauna, its flora, the people and landscapes that compose it. It is the well-nourished inspiration that he returns to the studio during the winter to paint on the canvas the wild beauties that seduced him. A little disappointed by the ministerial teaching of the present arts, he perfected his art by following courses here and there and by reading the masters. The practice of his art is for him an insatiable quest for truth, a question, a cry. One day, faced with a rather complex question, one of his teachers simply replied "paint what you see". This sentence was revealing and since then the practice and observation of nature remain for him the best way to learn. A practiced eye can decipher the subtlety of tones, values ​​and colors and a receptive heart translates poetry, the essence of the subject. It is thus that he paints what he sees, what pleases him. We must see as much with the eyes of flesh as with those of the soul. To depict him, it is to preserve this contact between the body and the soul, the earth and the sky, a bond that tends to be broken by our superficial societies. His paintings are at once a wonder, a reverence towards the subject. It can be effaced to pay homage to the subtlety of a bird's plumage, respecting the smallest details, and sometimes summarizing the top of the spruce trees with a single brush stroke. His soul is inspired as much by the cold mists of a dark autumn morning as by the heat of a sun from noon to its setting on the horizon or by a deer at the edge of the woods. He also draws inspiration from American native culture and spirituality because it joins his wild, free temperament. He also loves fantastic universes, creatures and mythology.